Having only first watched Red Dwarf in its repeat season in ’94, and not being part of fandom until 2002, I’ve often wondered what those early days of fandom were like. So, with Dimension Jump XVI nearly upon us, what better time to go back to the beginning and find out how it all started? We snagged Nic Farey, founder and chairman of the The Official Red Dwarf Fanclub from its inception in 1990 to 1993, and Maxine Lehmann, who was involved with the club until 1997. Can you remember the first time you saw Red Dwarf ? What was it about the show that made such an impression on you? Nic: The first time I saw the show was the first time it aired – 15 February 1988! (Gahd, is that really 23 years ago?) From the trailers I recall it looked as if it might be some good, and indeed it was! As an SF fan I’d have been interested anyway, but what struck me a lot was that the show was in the great tradition of “closed environment” British sitcoms in which antagonistic characters are essentially stuck with each other ( Steptoe and Son is my favourite example of this). As the first season episodes progressed, it was also pretty clear that the writers knew their science fiction tropes (I knew nothing of ‘Dave Hollins’ at this point), and as well as being very, very funny, the show was to my mind also good SF. Maxine: I missed out on the start of Red Dwarf , personally. I caught the tail end of Series 1 when an English teacher had our class each give a talk each, one of the designated titles being “My Favourite TV Programme”. A couple of lads in my class talked about Red Dwarf , and being intrigued I picked it up at Confidence and Paranoia . Massively hooked by this, I was pretty disappointed to find the series end so soon and waited eagerly for more. I was fifteen at the time and for me Red Dwarf fitted the gap that many unhappy teenagers would fill with obsessing over a pop group. My best friend and I were so captivated by Red Dwarf that we looked out for magazines carrying info, and when the merchandise started to appear I was buying it up at a crazy rate. We started to write what, in retrospect, I realise was effectively fan fiction at one point, hoping to see a Red Dwarf book published, and while we novelised episodes like this we also wrote new stories. On contacting Grant Naylor as naive hopefuls (at that time via Paul Jackson Productions as GNP didn’t yet exist), we were put in touch with the fan club. Nic, were you already involved in SF fandom at that point? Nic: Yes, I discovered fandom in about 1981 via a co-worker who was a major Doctor Who fan. He clued me in on the monthly first Thursday London meetings – basically just a gathering point for all flavours of SF fans, at that time held in a fairly tiny bar near Farringdon tube station (it’s moved several times since those days). I met my first wife there; she got me going on the Star Trek fan club and conventions which she ran, and from there, through meeting a Birmingham bookseller named Rog Peyton, I also got into the Birmingham Novacons (written science fiction) and made some long-lasting friendships there. Maxine: What doesn’t sink in for a lot of people now is that things were very, very different back in the 80s and you couldn’t look stuff up instantly, or find people who shared your hobbies and interests unless they were on your doorstep. A fan club was an amazingly exciting proposition, and a fanzine with a letters column and the opportunity to find penpals was filling the space now vastly taken up by the internet. Perhaps if I’d lived in London or nearby I’d have found science fiction fandom earlier – I was certainly interested from an early age. But perhaps not – I was, after all, a largely isolated teenager with no links into the community. As it was, I lived in a small town not a huge distance from Birmingham and I remember the crushing realisation, upon reading a listings magazine, that we had narrowly missed seeing Rob and Doug when they did a signing session for the first novel. Over the next couple of years I ended up doing A-levels, then leaving home. Along the way, though, I’d become friendly with Danny John-Jules (who was to copy his own video of Series 1 for me, thus letting me catch up on the episodes I’d missed), attended Red Dwarf recordings, and started helping out more and more on the fan club ‘zine, Better Than Life. It was mostly down to transcribing a thousand bits of fanfic, reviews and letters that I got familiar with computers – first for word processing, then for desktop publishing. Later, I was to set up a website for the club, learning HTML in the process which later became the route into my present career (I code web pages for the BBC these days). How did you go about setting up the fanclub? How did you let people know about it? Nic: Looking back, it seems kind of haphazard really! Red Dwarf was a frequent topic of conversation at the London First Thursday meetings (which by this time were being held at the Wellington pub by Waterloo Station), and as fans do, the topic of “we should start a fan club” was raised. Having had some fan club experience with the Star Trek lot (I’d also published a fanzine or two by this point), and being really into the show, I was coming up with some ideas on how it might be done. After a couple of months of this kind of chit-chat, various people were admonishing me to get on and do it instead of just talking about it, so I applied my organisational skills and came up with a plan. 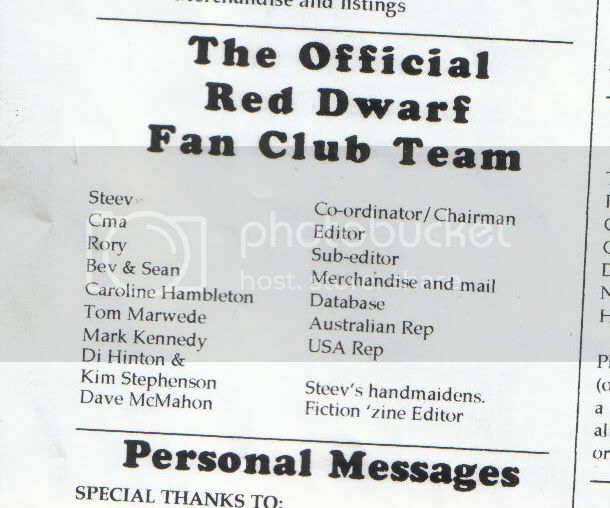 Historically, then, The Official Red Dwarf Fan Club was indeed started in a pub… We had word-of-mouth going, ads in other fan club ‘zines we knew of, SF newsletters and so on, thinking that we’d maybe get a couple hundred members (ahem). What was your first contact with Rob and Doug? Nic: Part of the master plan (ahem) included an idea to make the club “Official” by getting the blessing of Rob and Doug, so I contacted their office with an outline of what we were trying to do, the structure of it, newsletter schedules and so on, and set up a meeting. This was really before anything had gotten started, although I’d made some enquiries about badges, membership cards and the like from suppliers I’d used before in other fannish endeavours. I went in with a copy of the SF newszine Critical Wave , published by my great friends Martin Tudor and Steve Green in the Midlands, basically selling Rob and Doug that the fan club newsletter would be “like this”. The lads were interested, welcoming and put me well at ease. That first meeting of maybe 30 minutes ended up with a “Go for it, Nic”, so we were committed at that point (or should have been). How did that very first Dimension Jump go, back in 1992? Nic: Very well, I thought, in that we achieved our objectives in running it. Attendance could have been better (about 150, maybe even a little less), but we weren’t expecting Wembley crowds anyway. I’d used that particular Northampton hotel before for other small events, so I was familiar with the layout and facilities, and as important as anything, the staff were familiar with me and with the type of event we were running. There was a certain amount of silliness on the program, but probably the best thing about it was getting the actors and backroom people (and of course, Rob & Doug) that we did, pretty much just for expenses. Front cover and contents page of BTL #1. Why did you decide to step down as chairman of the fanclub? Nic: Basically, I was moving to the States. That simple. Maxine: By the time Nic left the country I was doing a lot of the fanzine, helping organise the envelope-stuffing sessions, and contributing to getting the conventions working. A few people assumed that I would step into the role of chairing the club, but Nic quite sensibly handed it over to a whole team of people who had different responsibilities and my own was to look after the fanzine. The numbers grew into thousands as Red Dwarf became more popular, saw repeats, had video releases and so on. There was a core of regular people who were very involved in the club, and meet-ups started to happen around the country. To this day the big toe on my right foot is damaged as a result of a Monopoly Board pub crawl and I’m still in touch, albeit not regularly, with a handful of people I met through the fan club initially. We had in-jokes and running themes and so on, such as any thriving community does. I think, though, that asking about Nic’s involvement with general SF fandom leads to something of a misnomer. Most Red Dwarf fans, the ones interested enough to go on forums these days, or to spend actual money to join a club back then, were actually interested in Dwarf and not SF as a whole. There’s a surprisingly narrow overlap (or there was, perhaps that’s changed), despite, as Nic says, the SF tropes within RD being very well observed. This was something that increased within the fan club as a lot of the fan base felt that they were more comedy fans with more in common with fans of stuff like The Young Ones , and wanting to distance themselves from the stereotypical Star Trek fan. Daft, really, as the mass media was already starting to shift to taking the piss out of Red Dwarf fans as being the kind of lowlife that trendy people should steer clear of. What kind of things have you been doing since leaving active Red Dwarf fandom? Nic: Assuming you mean in a fannish context, a few conventions here and there, local fan groups, and periodically (maybe that should be spasmodically) publishing issues of various fanzines of my own, which are currently all available online (along with many, many others) through the good offices of webmaster Bill Burns (an expat Brit in New York and a good friend). I’m currently involved with the Vegrants, a local Las Vegas social group of SF fans, fan writers and artists. Lately I’ve been into doing fannish song parodies and publishing these on my YouTube channel (search “fannish song parody” and you’ll find them). In other news, I went to jail a couple of times. Maxine: I stepped back from the fan club when it all got a bit too much. It was a hell of a lot of work. Although we had DTP software, we didn’t have a scanner, and the computer (A Macintosh Performa 475, fact fans!) was a bit weak and feeble when it came to handling large documents. Getting images into the fanzine involved taking slides from Grant Naylor, getting Boots to create photographs from them (for which purpose we had a signed letter from GNP saying they were the copyright holder and we did have permission to do this), then cutting and pasting in the traditional sense, with scissors and glue. We had a printer from which we created the master copy, but it took a minimum of three minutes to print a page and there was no form-feed, so it had to be done manually, for each individual side of the 60-page ‘zine. As it reached the bottom of each print I’d inevitably notice the typos, so I’d spend nearly a full day on just printing the bloody thing. Most people didn’t have computers, so submissions were hand written. While some things arrived on floppy disks there were still conversion issues, and we had no OCR software, so there were hours and hours of transcription and copy editing, plus we had regular calls and meetings to discuss the club in general. There were certain tensions within the team, and when I started full time work and then had a massive health scare it seemed it was time to quit. As a thank-you for the efforts I’d put in, the team told me I’d have a lifetime membership of the club, but apparently all the lifetime memberships expired the other year. To be honest, though, after I stopped running BTL I didn’t particularly like the direction it took (more UK-centric, lots more reference to pop culture, lower editorial standards with more typos and spelling mistakes, less focus on the direct fan interaction in the letters pages), and the team size seemed to keep growing unnecessarily. By the time I left the club management side of things the internet was starting to reach homes and I was getting a lot more out of interacting on the Red Dwarf newsgroup, alt.tv.red-dwarf. Red Dwarf played a huge part in my life, the fan club being just a part of that. It’s kind of sad that clubs don’t really have a huge role to play any more – the news is on the internet the minute it’s released, as are photographs and trailers. Anyone can find the conversations going on about their favourite show with minimal effort, and while some can and do foster communities, more of it is quite fractured and splintered. Strong, focused sites such as G&T do something to address this, and it’s certainly cheaper than joining a fan club, but there is a bit of a loss when there’s no fanzine to look forward to eagerly for the next fix of news and community. The Red Dwarf newsgroup has died a death, although I retain a number of friends I made through that as well as the fan club. These days I’m on the periphery of general science fiction fandom and spend a lot of my spare time involved in live action roleplay. Although I’ve largely left it behind now, I seriously have no idea who I’d be today if I hadn’t ever gotten involved in the fan side of Red Dwarf . Series 7 and 8 always seem to generate a lot of “discussion” in Dwarf fandom. What was your opinion of them? Maxine: For me, the pinnacle of Red Dwarf was Series 2. The enforced contact and claustrophobic atmosphere that Nic talks to as “closed environment” – the Porridge -in-Space kind of ethos was strongest there. As Red Dwarf went on the characters lost something of their depth and became cardboard cutout clones of the original concepts. Everything about Lister was curry-based, for example, everything about Rimmer was neuroses, and Cat cared about nothing except fashion. I think a lot of the charm was lost as it went. I have a bit of a soft spot for Series 6, having managed to see every episode recorded, but I think it was headed downhill on a shallow incline from before then, even. Red Dwarf VII was a brave move, but I felt like it had lost a lot of what had been so magical previously. I really didn’t like the return of Kochanski, because to me it felt like she would have worked far better as a character if she had been anyone but KK – having a weird she-is-but-she-isn’t thing going on just over-complicated things, especially with the retrofitting of her into a role that had previously been played very well by someone else. The episode with the mirror universe made no sense at all (I suspect key scenes were cut), and didn’t make up for it with the humour. I was more excited by Series 8 which tried to return to the early days in some respects, and came away from the recording I watched thinking they may have achieved it, but when it transitioned to screen it just felt unfunny, over the top and drawn out at length. Lots of this is possibly down to my own age and perspective; I joined Red Dwarf as a kid with little experience of the world. By the time Series 8 was going out I was in a totally different place, and it was really quite a disappointment. I felt to some extent Doug didn’t recognise the jewel he’d had but had tried to recreate it anyway. Did you see the Back To Earth specials, from 2009? If so, what did you think of them? Maxine: I watched the Dave episodes with a sense of discomfort and embarrassment, to be perfectly honest. It seemed to be trying too hard to be funny while having a strung out and confusing plot base. That said, there have been some gems in even the stuff I didn’t like much. The bit where they zoom, enhance, flip, zoom, enhance and so forth on a photograph was genius. I don’t think any new Red Dwarf can ever live up to my halcyon ideals and memories of the early stuff. With many thanks to Nic Farey and Maxine Lehmann, and to David Langford for the initial contact. As Red Dwarf went on the characters lost something of their depth and became cardboard cutout clones of the original concepts. I didn’t really notice that to be honest… and I’m not sure I totally agree, although I see his point. I do see that certain factors within the characters personalities were pushed to the forefront more (Lister/curry for example, although he showed a liking for that in series 2) but was the rest pushed aside? I can see how it might seem that way when they dropped the Lister/Rimmer bunk scenes, but on the other hand the other series (3 – 7) tended to have more complex sci-fi plots. Where it may have lost a bit in one area (and I’m not entirely sure that’s true, I think there were plenty of character pieces in later series, albeit it was portrayed in different ways) it perhaps gained in others. It all comes down to personal preference in the end. So what is it? I’ve never seen one before, no-one has, but I’m guessing it’s an article!?!? Only joking, this was a great read. I can see the point he’s trying to make but I don’t really agree with that statement. My personal feeling is that the characters gained more depth as the show went on, especially Rimmer. Okay, it may have gone a little haywire by Series VIII, but I don’t think they lost their way as early as post-Series II. Infact, I think II is where the characters really started to grow. But I guess it is all down to personal preference (as ChrisM said) really: Max’s favourite series is II, and that’s a great series and one I’d put up there as one of the best. I’m still trying to decide whether I’d say IV or V is my No. 1 favourite – I’ve been rewatching the shows again recently. When I was younger, I would probably say VI is my favourite but looking at them all again now, I don’t seem to feel the same way. I can see the point he’s trying to make but I don’t really agree with that statement. Max is short for Maxine – female. I’ve altered the article to say Maxine throughout, so nobody is confused! Also: I don’t want to stifle debate here, and I *know* I’ve asked for the VII/VIII debate to be brought up again. But the main reason I asked it in the article is to see whether it had any significance on why Nic and Max drifted away from fandom. I’d love it if we could talk about some of the other things brought up in the piece. >In other news, I went to jail a couple of times. Out of interest, is there anyone kicking around the site (a certain Associate Producer aside) who was actually in any way in and around fandom during the ’90s? Would be great to get some other perspectives on the stuff talked about in this piece, if so. Getting images into the fanzine involved taking slides from Grant Naylor, getting Boots to create photographs from them (for which purpose we had a signed letter from GNP saying they were the copyright holder and we did have permission to do this), then cutting and pasting in the traditional sense, with scissors and glue. As much as people nowadays may try to replicate the ‘zine culture of previous decades with the styles, attitudes, approaches, aesthetics and so on (and in a lot of ways, the small-press comics scene still works along similar lines in terms of the sheer amount of physical endeavour involved in creating the things) there’s no denying that we’ve got it a hell of a lot easier nowadays. Although there must also have been far more of a thrill in getting physical slides from GNP than there is in pulling publicity shots from the net. Oops. Sorry about that. I saw another poster had used the word “his” when referring to another quote by Maxine so I just assumed that was right. > …wanting to distance themselves from the stereotypical Star Trek fan. Daft, really, as the mass media was already starting to shift to taking the piss out of Red Dwarf fans as being the kind of lowlife that trendy people should steer clear of. This kind of view makes what fanzine/club editors/members/chairpeople etc. did, especially during the ’90s, THAT much more commendable. As for how things stand right now…it says a lot that, in the climate of ‘oh twitter facebook twitter facebook twitter facebook twitter twitter twitter!’ (just quoting my mum there, lol) fanclubs, official or otherwise, and conventions such as DJ can even exist and still mean something. I say bravo to all those willing to take time out of their lives to work on them. They are giants! Regarding the old BTL, it makes me smile thinking of how we used to put our school newspaper together in a similar cut and paste way, then no bugger would read it lol. Despite how much I love how the world has connected through the Web, I sometimes have a huge desire to be back in the late 80s and early 90s when things were more limited. Reading about how the fan club started just sounds so damned romantic and exciting, because not only was it an opportunity for the club to channel their energy into something, but at the same time it was connecting so many people that simple would *never* have connected if the club, the mag and the convention didn’t exist. Yes, sorry. My bad. I should have paid more attention to the first paragraph. Hi. Max(ine) here. I do lurk, and keep an eye on what’s going on around Red Dwarf, still, but it’s not a big interest for me as it used to be. If the article here raises any questions feel free to ask, I’m happy to answer most things. Very interesting piece and good to know people from way back are still ‘lurking’. I’m just trying to recall which team member (prior to the current set up) said that most people who worked on the team ended up hating Dwarf! I never really questioned this but I guess there are not too many ex team people keeping in touch or active on the sites. The article seems very balanced to me and it’s good to read someone around from the start who isn’t totally slagging off the later ‘stuff’. It also raises the question of how people in general came to ‘find’ the fan club, It’s almost as if the internet killed off the original fan generation but in doing so, brought in a new generation! It would be interesting to get the views of some later team folk (or ex team folk) and compare opinions. Just dug out a few old BTL issues and read Maxines (CMA’s) goodbye column in issue #20. The earliest copy I have is #15, June 1995. The quality improvement, printwise and layout is obvious between these issues. I also notice that as long back as 1995, there were a few questions over the regularity of issues. It’s also interesting how the team member numbers seem to fluxuate after BTL #20, issue #34 seems to be down to 5 (with Mr Ellard as editor) then jumps back up to 8 (up to #20 it stood at 11). It also has to be noted that Ser V11 was originally received quite well in the mag so I might dig out a few Dimension Jump poll results. When Nic left I was in charge of the fanzine and Steev was doing the chairman role. Rory looked after the merchandise for a long time, and Dave McMahon, er, actually, embarrassingly I can’t recall what exactly he did. I think possibly the listings side of things – local groups and the likes. Bev was doing a kind of admin/social secretary role I think. Ahh, fair enough. Di and Kim weren’t really team members as such, they were willing helpers, on hand a lot, but they were mostly used on envelope stuffing days and so on – if there was a meeting with Grant Naylor, for example, then they wouldn’t go along. They were incredibly helpful, though. But you’ll notice they had no “Balance of Power” write-up in the fanzine, while the more hands on people did. I wouldn’t really call Tom and Mark members of “our” team, either. It was a working relationship that stopped us paying a fortune for postage to overseas fans. Tom and Mark received a master copy of BTL and arranged their own printing overseas, and they added their own sheet or two of local news, meetings etc. I’d love to get back in touch with Di and Kim but lost contact a good few years back now. Di would be particularly difficult to trace as she changed her surname and I don’t know what to. What I find most interesting about all this is how Dwarf has been received over the years and how current views of the times have changed. The BTL polls clearly show that VII and VIII were received very well at the time and the arrival of VIII did little to dent VII’s popularity. The episodes from VII that broke into the top 20 in issue 23 were still holding their own in issue 30 after VIII featured. Gunmen and BTR swapped places at No1 and Quarantine stayed at No3, these 3 episodes polling miles ahead of the rest,after the top 3 though, VII and VIII had a huge impact. Unbelievably perhaps, Cassandra was only just pipped by Ace as favourite guest character and Kill Crazy was joint 4th with Talkie! Obviously trends change and it has to be said that any poll is effected by the recentness of shows. It can also be affected by ‘new’ generations of incoming fans although it’s surprising how many names keep popping up in the magazines over the years suggesting that the same core of fans remained ‘faithful’ and many fans are still about now. At some point in history, views seem to have changed somewhat, maybe later polls will pinpoint the change. No doubt, the arrival of dedicated web sites including rd.co have had a huge effect on peoples outlook of Dwarf and TV in general and may well have brought in a whole new generation of fans, much more savvy in the technical side of things. Viewing figures speak for themselves and quality, whatever asside, success is success. My own feeling is that the arrival of readily available media like video and DVD is one reason for a change of outlook. Whereas, back in the day, people watched shows from a certain point onwards progressively over years, many now pick up a set of DVD’s and watch the whole lot back to back over days. People either go with the show and enjoy how it evolves or lose their interest along the way due to the inevitable changes. >Out of interest, is there anyone kicking around the site (a certain Associate producer aside) who was actually in any way in and around fandom during the ’90s? Would be great to get some other perspectives on the stuff talked about in this peice, if so. depending on what counts in your question there, if you mean organising anything or involved, then no. Red Dwarf III was the first show I actively videod off the TV to fill an E180. School friends were into the show a little from the off, I’d watched since episode 2, so there was people around to talk to about the show, in the way that people used to talk more about last nights TV when there were less channles, but by the 90’s interest in the show had grown with so many great series aired. The exsistence of a fan club with magazine widened the fun a little more at that time. You got a bit of detail and behind the scenes insight from BTL that wasnt around elsewhere as much (though there was the odd book or magazine), if they published your submission you got a sense of contributing to something fun for fans and a keep sake, it’s exsistence must have inspired me to submit, and I like some of funny stuff that fans sent in, with the pen friends discussion of the show got more insightful than just “wasnt that bit funny last night” and lead to unrelated things like music discussions and mix tapes swapping for me at least. The early convention I could get to cus it was luckily local at the age when I was allowed to go, and beyond the fun of meeting Danny in person and his Q and A etc. Peter Wragg and Paul Mcguiness I think, were amazing. At a time that was I think just pre-smegups, it was fun to hear disaster stories. Peter was a nervous talker but everyone listened intently to what he had to say and then more stories mostly about mishaps, and more drinks in the bar aftewards, and this being lightyears before the dvd documentarys the whole thing gave you a deeper appreciation of the shows ideas and construction, it was a joy to be a part of that so close to when it was all recorded, so had just recently happened. I think it was a little smaller than later conventions, but it felt like a friendly small pub full of people who all laughed about the same TV, and from the off injokes and the fun started so easily. And yeah there was more talk of Bottom and other BBC2 comedy than there was of star trek of anything like that so much. I also remember a few props being in the auction, so getting a chance to put the emo hawk on your head, was a laugh or hold a bazukoid. Plus a guy with an early computer laptop trying to get people to write a real hitch-hikers guide as a database, years before the internet. As treasured as that fun all was, I didnt stay as interested as the show hit that mid 90’s pause, and I went off to Uni. I cant say it felt, at least from my distance, a community as such in the 90’s, It was a great magazine or a great day out. I appreciate the effort that made that happen. Perhaps Dwarf’s always been more pockets of interest, coming and going, which I think most fan things have to some degree anyway. But This site and the internet made recent events and particulary Berkley Square to Broadcast day for Back to Earth feel like a community. With conventions still happening, a fan club still there, plus all the extra media around, an excellent official site and dvds it feels like there is more around now than back then. While nothing in the fanzine was fabricated, it is worth noting that a lot of negative stuff was abandoned quite often as we were, um, encouraged to promote the positive somewhat. We were, after all, the public voice of GNP to some extent where RD was concerned back in the day when there was no Twitter, company web pages and the likes to give people more direct contact.